PRIVATE EVENT SPACE Travel + Food — Craven + Co. Craven + Co. 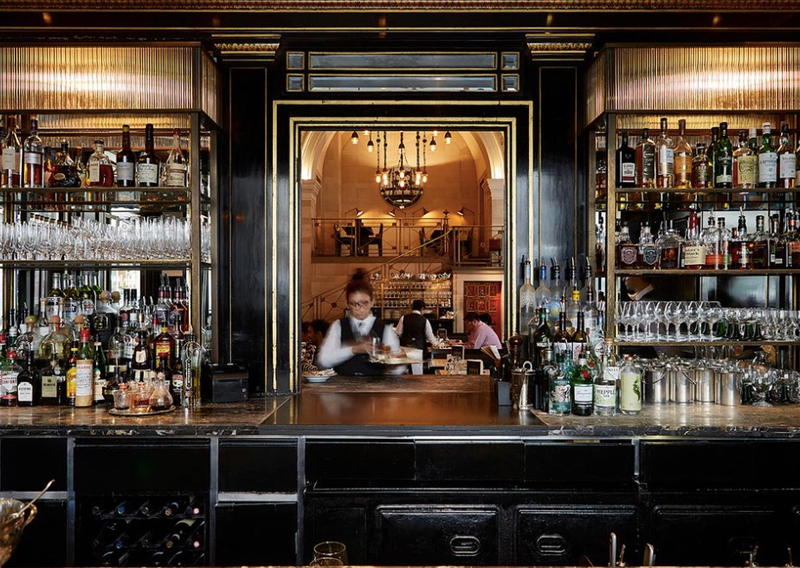 The Wolseley, by their own account, is an all-day café-restaurant in the grand European tradition. I'll agree, grand is a good way to describe it. The Wolsley is located in St. James in a beautiful building that was originally a car showroom for Wolsley Motors in 1921. The interior is a striking black with gold accents throughout. The ceilings are two stories high with arching stonework and gorgeous chandeliers you will wish you could fit in your own home somehow. They have an impressive breakfast, lunch & dinner menu and impressive service to match. The main dining room is a buzzing, see-and-be-seen vibe. 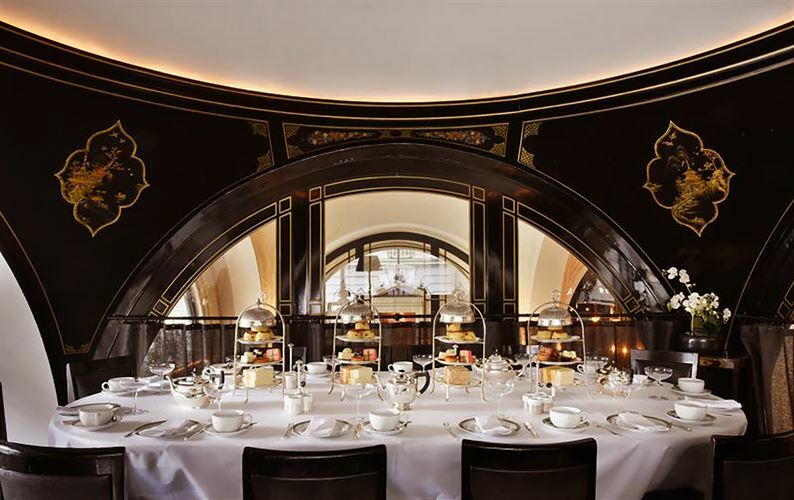 The first time I heard about The Wolseley, it was in a story about Anna Wintour, the ultimate tastemaker, being seen there. So I figured it must be worth a try, and it definitely was. Their private dining room will seat 14 guests. The room is accessed by its own private staircase and is perched in a decadent black and gold paneled room above everything else. The room is surrounded by arched windows overlooking the main dining room that fill the space with daylight if you book it for breakfast, lunch or tea. For dinner, the room's black and gold interior comes to life with candlelight and the light from the chandeliers that hang at eye level just outside. The windows make you feel like you're part of the restaurant buzz but they are draped on the bottom half so your group feels perfectly private. The restaurant also has a mezzanine level with tables that feel removed from the dining room, if you don't need a truly private space but want to feel set apart from the main area. It's a fun perch if you can manage to reserve it in advance. 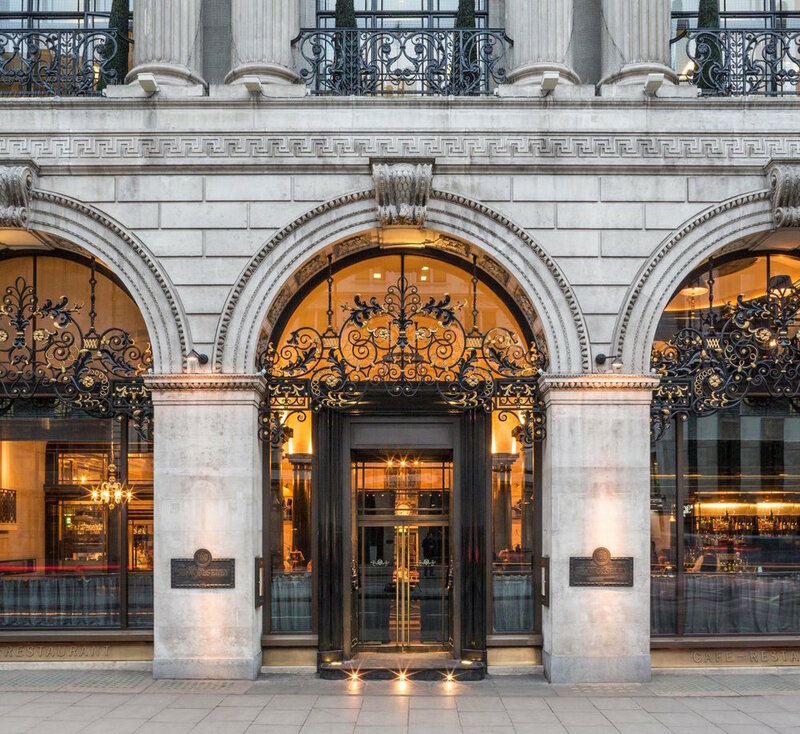 The Wolseley is part of our full London story, which you can read here. Follow us on Instagram for event inspiration and carefully curated private event spaces: @cravenandco. McGuire Moorman Hospitality is a design/style/taste/experience/food collective that makes you want to live an MMH life. I could do a breakfast, lunch, happy hour and dinner tour of their restaurants every day if my waistline and career would allow it. In each MMH restaurant, they've paid attention to every single detail: from the coaster your cocktail sits on to the uniform the valet who parked your car was wearing. That's why their restaurants have quickly become Austin staples. We've been planning events in the MMH private event spaces and working with their fashionable + cool events director, Fallon Allison, to create menus and experiences that our clients love for years now. 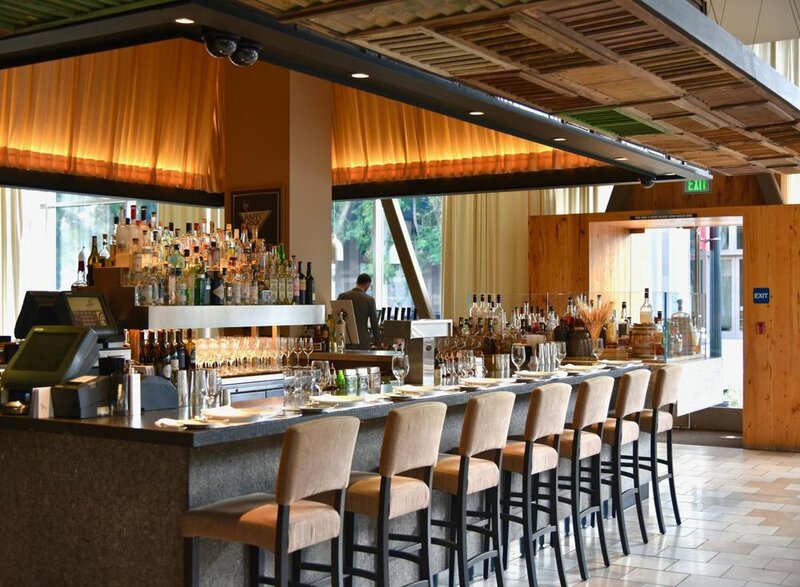 Ella is a gorgeous restaurant in downtown Sacramento, California that is part of the Selland Family Restaurant group. You can read more about it in our Travel + Food section. They have high standards for food, cocktails and service. The restaurant is designed to have several spaces that are perfect for a private event, whether it's a corporate reception to impress clients or just creating a cozy, private space for dinner or drinks with friends. This room was designed to have four walls and a closing door so the space is completely private. They can do different table configurations to seat up to 26 guests at one long table or up to 40 guests if your group can be at separate tables. With some tables removed, it's also a beautiful space for a standing reception for up to 50 guests. The Capitol Room is a portion of the Grande Capitol Room that is along the windows with a view of 12th Street. It has the same reclaimed shutters and long flowing drapes that you find in the main restaurant, so you still feel like you're part of the main room, but with your own little space. These are my favorite tables in the restaurant. It is not a private space but it has front row seating to the open kitchen. The tables are slightly separated from the other tables in the restaurant so that if you book both tables, you could roam around both tables and interact. It's great if you have a large group but want to feel like you're still part of the action. 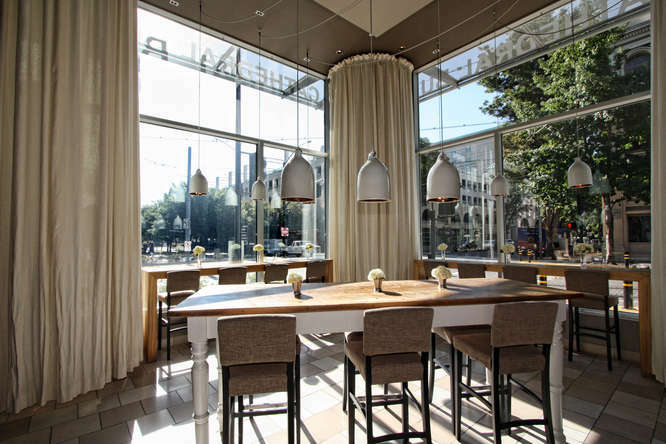 The grand scale pendant lights over the tables are a stunning design statement and make it feel like the area is designated for your group even though it's wide open to the restaurant. The tables are wide enough that you could add impressive centerpieces and still have room for everything else. We love the grand scale pendant lights over each table. They make the area feel defined as a private space even though it's open to the restaurant. This space would be ideal if you want to have your guests' full attention. It's a fully enclosed, narrow space. Ella provides a complimentary LCD TV for a business presentation or maybe you just want to watch the season finale of your favorite show with your girlfriends. It's cozy and fun. We're a little obsessed with the wallpaper, shabby chic chandeliers and draped walls. The beautiful, 360 degree bar is in the middle of the restaurant and separates the South Wing from the main restaurant. The South Wing has lounge seating and drapes you can pull to divide the space. You can use a portion of the South Wing by using these drapes OR you could take over the full South Wing plus add on the Kay Street Deck for an inside/outside flow. If you take over just the curtained off area at one end of the South Wing, you can have up to 12 guests seated for a small intimate dinner that's just steps away from the buzzing bar scene. A view of the 360 degree bar, South Wing lounge, communal tables and the awesome system of white pendant lights connecting it all. If this space is curtained off, you can have a private, seated dinner for up to 12 guests. This is the view at the corner of the restaurant overlooking 12th and K Street. I love planning a dinner on a terrace that is covered and addresses weather scenarios, because it takes away the worry of doing something outside. At Ella, they do all of that on their Kay Street Deck. They have a full ceiling of gorgeous white chandeliers, with misters for hot weather and heaters for cool weather. I also love this space for doing an indoor/outdoor event by combining the South Wing and the Kay Street Deck. Imagine a long communal table extending down the space with tons of candles...that's all you would need for a magical night. Ella is available for a full buy out as well. Full buy outs for any restaurant are available for a price, and usually it's a fairly high price. For a large group, a restaurant buy out can be worth it, especially since this restaurant includes stunning tables, chairs, china, flatware, glassware and linens. Ella gives you a gorgeous indoor space that feels wide open and connected, but still allows you to separate your cocktail and appetizer hour into the South Wing and Kay Street Deck before heading into the main dining room area for your sit down dinner. If you are interested in consulting with the Craven + Co. team, please email us: hello@cravenandco.com. We would love to hear from you! Be sure to follow us on Instagram for event inspiration + more carefully curated private event spaces: @cravenandco.